Write it, sing it, play it. : Vince Gill & friends at the Ryman!!! Vince Gill & friends at the Ryman!!! Today is a happy Monday for me. 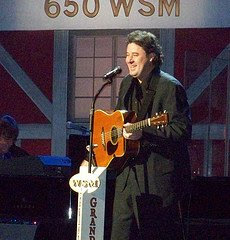 I got an early birthday present from Kristi(my soon-to-be Mrs.) She bought us tickets to see Vince Gill at the historic Ryman auditorium in downtown Nashville. Not only is Vince one of my heros, but the Ryman is my favorite building in all of Nashville. It has such a wonderful history. I am so very excited and hopefully will get to meet him. He will be joined by his daughter, Jenny Gill(whom I met last year), Rodney Crowell(also one of my favorite songwriters) and a few others. I plan on posting a review of the show...biased I am sure.